People owe us what we imagine they will give us. We must forgive them this debt. To accept the fact that they are other than the creatures of our imagination is to imitate the renunciation of God. I am also other than what I imagine myself to be. I have found these two voices resonating in me in these potent days of quiet. Passing through this time of year, many of us seem to experience moments raw with vulnerability or touched by grace. I’ll say a little about what these words carry for me and invite me toward. Simone Weil’s have both haunted and held me for about 25 years. They do not lessen in their import. When placed alongside Leonard’s understanding of the gifts of longing, from Born in Chains, something seems to deepen and warm. In Weil’s words I hear always the recognition of the ‘surplus’ of our hope. Of how, when we are close to others – parents, children, lovers, partners, friends - it is so easy for our deep longings and unresolved hungers to constellate around them, expecting, finally to be salved. Our imaginations - as Weil says - create, without us quite realising it, a sense of ‘entitlement’ to receive what we hope for. (We often do not experience this as entitlement, but as some kind of inherent sense of relief: we know that this longed for quality is finally, finally in our grasp...) A long-awaited satiation of whatever our particular hunger - for tenderness, understanding, devotion, constancy – seems near at hand. And then, inevitably, life happens. Their difference from our expectations crashes into us. Our beloveds express and manifest an independent will; they articulate their own unfoldment in some way or other that dismays us and confronts us with the hope we unconsciously placed in them. And sometimes this is shattering. Sometimes the open-hearted faith we were in the way of feels so crushed, so wounded, so devastated. Our pain and disappointment are fierce. Our hurt or anger may be great. What we do then – what we are able to do – matters greatly. Can we bear our disappointment? Can we see that our needs and longings were our own and not commitments they ever signed up to? Can we – in Weil’s terms – forgive them the ‘debt’ we placed on them? It’s hard, often. There is grieving. There is impact. There may be resentment, a sense of betrayal, a desire to reject. A catastrophic, familiar despair. But if - as Leonard says - ‘the soul unfolds in the chambers of its longing…’ this raw confrontation with our own disappointment is also an opportunity: We are invited to deepen and grow. Yeats wrote so beautifully of this need for the soul to embrace the unwanted impacts of living: 'An aged man is but a paltry thing, a tattered coat upon a stick, unless / Soul clap its hands and sing, and louder sing / For every tatter in its mortal dress…’ When we can find a capacity to meet our own longing, to feel its resounding momentum and the grief of its disappointment inside us, we deepen and unfold the life of the soul. Weil asks us to do this - to renounce our claim on others – to shed the role we have carved for them and the illusion that we know who and how they should be. Unfortunately, for the part of us that wishes to use them for something, we must accept that they are ‘other than creatures of our imagination’. They are not supposed to be who we have longed for, even if some archaic part of our psyche demands that they must. Can we live in the paradox and tension of our longing – allowing it to blossom – which Leonard was so good at, but not to insist on its gratification? Can we be this gracious and humble each other, this alive and willing to host the longings in our souls? ‘I also am other than I imagine myself to be. To know this is forgiveness’. In our capacity to mistake both our own characters and our essence, we find ourselves down among those who have (in our imaginations) ‘wronged’ us. We are stopped in our tracks. Yet to rest into this disorienting humility – to know that we do not know ourselves – is the beginning of something else. It releases a profoundly intimate warmth - a forgiveness that can touch us with a kind of sombre, witnessing tenderness, holding our frailty and humanness. “This being is like a friend. It is a friend. It travels with us..."
I made my Lofty Companion from a careful choice among my actual qualities, plus qualities I pulled out of the air, with much denial and wish fulfilment as glue. There’s a few things I love about this concept of Bly’s: its’ attention to our inner goodness and unique visions as children; its’ highlighting of the warmth and particularity of our inner compasses and the dreamy part of our inner relation to ourselves. I also love it for the space it opens to notice and celebrate the loftiness in our friends, and the source of nourishment their particular ideals can be for us. Bly evocatively describes our relationship with the Lofty Companion, and his words help us recall an ephemeral, often unacknowledged process which many of us will recognise. Though in some ways his concept is close to Freud’s ego-ideal: “the part of the mind which imposes on itself concepts of ideal behaviour developed from parental and social”, as Bly says, ‘that’s boring and the name misses the companionship it provides’. Bly’s description is more souful, poetic and honouring of quirky uniqueness. “Creating a Lofty Companion, which is your life's work for about ten years, tends to isolate you from others because you need to listen, to him or her or it...This agency of aspiration is more adept than we are, and will be our entry into success, authenticity and achievement." Her Bly captures the vitality and strength generated by the Lofty Companion – how its aspirations can carry us like a calling, energising and giving shape to our lives. In a sense, it helps to ‘launch’ us into the complexity of adulthood, creating a beautiful if naïve image we attempt to represent. That we will inevitably fail at this in all sorts of humbling ways is something we do not yet know. the creation also brings you closer to great people alive now whom you hear of, an artist, an inventor, a musician, also the great people who are dead and whom only you understand. In exploring our relationship with the Lofty Companion, Bly is also honouring an era in our lives that is rarely treasured. The Lofty Companion is a warm thread of interior continuity between childhood, adolescence and young adulthood., bearing testimony to a steady private goodness, a subtle process of eros within us. It is a truly rich element of the interior life of these years, (which we are inclined to think of in such cliched terms). Bly’s emphasis recalibrates our vision of youth, capturing the mood of our ideals and how they form an intention or longing inside us to contribute. Much of our beauty lies there. Reading Bly on this threw up a further resonance with lofti-ness and how it can nourish us - Why and how do good friends nourish us, specifically? How does another’s loftiness reach us? Friends who are good and in touch with their own ‘energy of aspiration’ help us both practically (in advice and companionship) but also through how we imbibe their goodness and take it inside us over the course of our knowing of them. To live in attunment to the goodness of others – friends, family members, spiritual figures, historical ancestors – is a deep blessing. It offers a kind of ethical, civic buoyancy that supports us when we feel depleted; when our faith in humans falters; when we are disappointed, despairing or betrayed. When we sense others’ goodness intimately, when we have an affinity with the loftiness inside them and their attempts to manifest it, counteracts so many ills: alienation, disappointment, some sad, cynical, minimalist belief that we are all out for ourselves. Those of us who are lucky, have seen too much goodness for that. To be able to practice with good friends for five, ten, twenty, thirty, or forty years is a special joy. So much comes of it. As you ripen and age, you appreciate the nobility and uniqueness of each friend, the twists and turns of each life, and the gift each has given you. After a while you begin attending the funerals of your dearest friends, and each loss seems to increase the gravity and preciousness of your own life and makes the remaining friendships even more important. So there is deep grace in sensing an affinity with the goodness in our friends, and living near to it. Like us, our friends will not always live up to the ideals of their young longings, but if they have treasured and struggled with the Lofty within them, they inspire us to be better in ways we cannot be alone. Sometimes you come across an idea that sheds light on familiar territory and something clarifies from a new angle. This happened me several times reading Chronic Shame by Patricia DeYoung. I want to focus on just one fragment here, in case it has resonance for others: it is about learning to relate to and from ourselves as if our inner experience actually matters. Learning to abide with ourselves. This probably sounds extremely simple, but it is a source of huge struggle for many of us to take account of ourselves in a natural, balanced way. So the respect for inner experience I am referring to is not about self-obsession, or placing ourselves ahead of others, it is about knowing how to balance our natural capacity to care so that it becomes available to our inner selves in an ongoing, life-giving way. The sentence that triggered me looking at this differently comes up when DeYoung quotes Francis Broucek on the importance of parents “reflecting a child as both subject an object, so a child has a chance to learn both ways of being in the world...” I felt an immediate sense of beauty, balance and alignment when I read that phrase. Since then, a clarity about our need to relate and be related to from both angles has been reverberating through me – we are living, sensitive creatures with inner experience that is precious, and creatures who inhabit a shared, inter-penetrating world impacting life and others, who, hopefully, want to do that with maturity, grace and love. we grow up vulnerable to forgetting ourselves. So that’s the territory we are in: how to achieve a balance between these two. The point DeYoung makes next is essential – of these two ‘ways of relating’, in our formative years, the subjective element is most essential: In early life we really, really need it. For, [when objectification dominates] “the child loses the possibility of recovering what Francis Broucek calls primary communion with others….” In other words, if we are related to chiefly in terms of our outsides, something goes wrong in our capacity to bond from (and with) the middle of ourselves. When our inner experience is not mirrored back to us as existing or worthy of relating to, we learn, implicitly, that how it is to be us is irrelevant to how the world flows. This can have big repercussions, because we tend to replicate, ad infinitum, this blindness to our own insides. So, when the balance leans toward objectification in our early lives, we grow up vulnerable to forgetting ourselves. We learn to automatically leave ourselves out, unconsciously believing this is required of us in order to belong, be loveable, or be worthy of contact with others. It is important to distinguish between this self-forgetting and the mature, nourishing surrender of absorption in service, work or play. This is more like a bias of neglect - an unconscious impulse to over-ride ourselves, as if it is necessary to do so. Natural self-care eludes us. This instinct toward self-neglect appears to be a foreign country to the people I know who are happiest. They seem to have an organic, warm bond with their own subjectivity – an inner friendship that is primary, affection for themselves and a natural concern that they be happy. They live and relate among others naturally as if they matter – not merely as functioning things who should function well (though many of them care very deeply about this), but as humans whose own happiness is a natural priority for them. They act and move in ways that reflect their sensibilities and preferences without a process of struggle or fraught anxiety about whether they will be punished or rejected for doing so. When I think about those of us who struggle more, we seem inclined to over-ride our subjectivity as a matter of course. We live as if impacts and imprints on our souls should not hurt us, or interrupt our functioning. We do not easily heed signals of distress when they arise inside us, or consider that we might pause to abide with ourselves. We may not know how, or feel that we are ‘allowed’ to. At some very fundamental level, we have not imbibed that our insides are worthy of care, so, at least in company, we unconsciously presume we must abandon them. Yet in our self-abandonment, it is not just we who suffer: we often end up far more preoccupied with ourselves than those who take themselves into account. This makes sense: neglect is not good for anything. So, ironically, over time, the habit of self-neglect leaves us at risk of becoming self-obsessed in complex and demanding ways, swamped as we are by the distress of our own unsupported, ravenous-to-be-related to inner states. how can we learn to care? So, how can we learn to care? It is often said that what is formed relationally needs to be healed relationally. Probably the most potent way initially to address this deficit is to cultivate relationships (whether therapeutic or personal) in which our inner selves are related to with interest and love. Many of the most powerful moments in healing occur when we are caught in some form of despair about ourselves (where at some level we are experiencing ourselves as failing objects), and another mirrors back to us something more raw, tender and acknowledging of our insides. Something in how they hold us allows us, however briefly, to be nourished there, to temporarily abandon the objectification, to be merely, unhappily human, but abided with, embraced, offered, in Broucek’s term, primary communion. Moments like these are miniature trainings, recalibrations wherein we learn, viscerally, that we are worthy of being related to, just for our sakes. We feel the goodness of this. It touches us deeply, and may shock us in its intimacy and tenderness. This tenderness may surface new layers of sensitivity and pain. But it also begins to ignite a new interior capacity – to notice and respect ourselves with a parallel commitment, to care for what we find inside ourselves, to abide with our own interior without moving away. One of my favourite statements by one of my favourite analytic writers, Christopher Bollas is that one of the most valuable outcomes of psychotherapy is its capacity to ‘transform a person’s relation to themselves as an object of care’ – in other words, being intimately cared for and related to with true respect can, over time, transform how we treat ourselves. 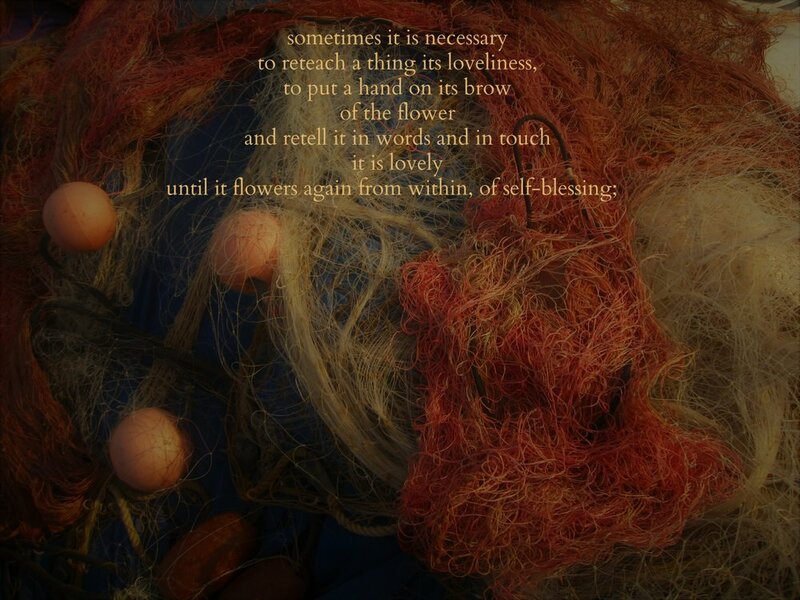 As Galway Kinnel writes: 'sometimes it is necessary / to reteach a thing its loveliness, to put a hand on its brow / of the flower / and retell it in words and in touch it is lovely / until it flowers again from within, of self-blessing.' May those of us who have misplaced it, begin remembering our loveliness in ways that nourish our inner and outer rhythms, and soften the hard moments of our lives. This piece dovetails with a few other pieces I've written: It: Thou after Buber on another way we forget ourselves in service to others; reflections On Love by Milosz - a stunning poem about this balance of care for self and world; and a book review of DeYoung's book on Shame). Below, the full poem by Galway Kinnell. From the point of view of mood, this is a disaster: we find ourselves at odds with our own experience, constrained and cautious with others, ‘knowing’ there is much we must repress. We find ourselves isolated, living muted lives, sadder than we feel we should be. Why – when they seem so negative - might we choose to make room for feelings such as these? Because we are suffering. Because sadness or despair can be a stagnant place, arising from an inner impulse to deaden, a shutting down to impact. Faced with pain, we learned to block, to dissociate, to rationalize and to pretend. But all this cuts is off from a flow/rhythm of renewal etc. ‘Bad’ feelings are a natural part of life. For as long as they seem a threat, we will be bullied by them. If we want to build our strength/resilience, we must develop our capacity to remain alive, sensitive and open, amid unwanted things. This helps us feel robust and secure: Finally, we can start to trust ourselves to feel the emotions we have always felt obliged to reject – to experience what we actually think and feel, however often we have muted it. Among the deeply moody, for all our claims of enduring great suffering, most of us are bad at actually feeling bad. We can speak about it, we can describe our awful moods but do not actually know how to feel them. Insidiously they seep into us – and fuel low mood. Anger is a central element in this recovery. Freud pointed out that depressives tend to skew their anger, frustration and disappointment into self-hatred, bitterness and diffuse resentment. If we disavow anger and desire, so much grinds to a halt. So tuning into our anger, learning to allow it and engage it, can be at the heart of recovering our capacity to feel bad well – and thus to live well. The first part of the chapter explores the value of opening to and ‘including’ anger, learning to allow ourselves to experience it viscerally, and learning to attend to the messages that it contains. We then look at ‘what lies beneath’: the other emotions: disappointment, longing, heart, which anger arises in response to. We explore how to feel these things, and what their significance is within the economy of our sadness. The gloom of the world is but a shadow. Behind it, yet within our reach, is joy. There is radiance and glory in darkness, could we but see. And to see, we have only to look. I beseech you to look! Life is so full of meaning and purpose, so full of beauty beneath its covering, that you will find earth but cloaks your heaven. Courage then to claim it; that is all! But courage you have, and the knowledge that we are pilgrims together, wending through unknown country home. Many of you will be familiar with this beautiful piece of writing. I first came across it when it was sent to me about twenty years ago by my friend Kieran. We are still friends, and both of us, in that time, have become better, if such a thing is possible, at bearing suffering and becoming available to joy. Yet on my worst days, Fra Giovanni’s Letter irritated me – for its apparent casualness about pain, it’s insistence that joy lies near and may be easily found. (such ‘good news’ feels almost offensive when our minds loop in distress and our souls congeal in gloom). And yet it is a hard text to really reject, because it’s tone is so lovely: It is a passionate and personal expression of deep friendship, imbued with conviction, faith and encouragement.
' The gloom of the world is but a shadow. For those of us allied to gloom, how may we see beyond it? How can we heed Giovanni's invitation and make sure that, if joy is available, we learn to taste it? How can we make sure we don’t get stuck in one ‘genre’ of human experience and miss out on the more buoyant, light and beautiful side of things? This notion of genre is so important – and our subtle loyalty to tragedy. Those of us who have an affinity with suffering so easily get trapped there. I love what Adam Phillips has to say about this preference for particular genres: ‘part of [our] predicament that [we are] trapped in a specific genre...unable to move freely among the genres available, [our] farces, say, are all experienced as tragedies…’ This is the natural leaning for many of us - to loop within a dominant atmosphere of masochistic or fatalistic lament, identified and bonded with a notion that life is a place where something is, and always will be 'wrong'. How do we evolve beyond this: loosen and learn to inhabit other genres - Where is our joy? Where are our comedies - our romances? Where is the ‘radiance and glory' of which Giovanni speaks? Joy arises on the cusp of our capacity to be touched freshly by life - to be surprised. We cannot command 'joy', but we can develop our ability to live in such a way that joy arises more frequently, and registers more fully in us, altering our sense of goodness, abundance and vitality. Fra Giovanni's line: 'the gloom of the world is but a shadow...behind it, yet within reach, is joy...' captures how joy may often be found 'just behind' or 'inside' an experience that we may be interpreting as difficult or painful. His assertion that joy is 'within reach' even in the midst of apparent gloom, asks us to look more closely, to see 'what else' is happening, which may be evading our notice. Giovanni is not a bad guide here: his answers seem to lie in Looking Deeper, Receptivity, and Courage. And I would add to this – when we flounder - good and loving others in whom we have faith, who reveal horizons and capacities obscure to us. empowers us to engage with rather than ‘manage’ our distress. Learning ‘to look’ differently is a skill we can develop, and when we do, our transformation is authentic, our capacity to ‘see through’ what once seemed opaque states – to a more light and lucid emptiness becomes possible. We come to see moments untarnished by bias, beauty uninterrupted by dread. Joy is also often found when we slow down. This is because - while the mind can experience excitement - joy is often more sensual and subtle. We may be transported by presence, by a quality of calm, by a moment of perception of beauty or love, by an unanticipated look of happiness in a child or stranger. And yet, this space of struggle is never a complete picture. Can we move freely, at least sometimes, to life beyond the veil of pain: can we bear witness to the taste of beauty, the feel of grace and the sense of a benign and loving angel’s hand? When we have the courage and clarity to risk seeing freshly, an alternate world opens. In place of the ‘heart of darkness’, lies subtle, alternate life. Beneath and behind the veil of recalcitrant thought lies a living body: Vivid cellular movement, sensual presence, freshness and flow. This is the rich vein of life moving in us, beneath and beyond identification, bias and ego, like an underground stream of revelation. It is often a source of enormous vitality and joy. Yet most of us need encouragement to learn to dwell there: support in our suffering and encouragement sometimes to release it. In this, few things are as soothing or supportive of our well-being as human warmth, as capable of transforming our tragedies to comedies and our disasters to unlikely romances. We need and long for one another more than we often care to say. Central to the beauty of this letter is that it is written with such intense love, and from a place of ‘having been there’ - not from a hierarchy of any kind, but from the position that ‘we are all pilgrims together, wending through unknown country home’. In some sense, disappointment is always a story of failure. What we longed for did not come. Some people can digest this, live on to express a new desire, to fight another day. For others it is an occasion of shame and despair: an utterly ordinary human experience we cannot bear to feel. We simply feel too hopeless or too hurt. And so we like to pretend it is not there. Of course our resistance to disappointment has its reasons: Disappointment hurts. It is blunt, immediate and stark. It does – temporarily – threaten harmony. It does – momentarily - make us feel bad. Acknowledging it recalls us to difficult things: a sense of failure, hurt. These seem a bad idea to take in. The truth is, it need not be a threat, yet we act as if it is. We ‘naturally’ contract against disappointment, becoming in the process, estranged from ourselves. This takes place all the time: small, unacknowledged disappointments accumulate inside us. We resist them in the attempt to ward off pain. Yet each time we do, we express a lack of faith that we can live through it fruitfully. We can, but we may not know this yet. What makes so ordinary an experience become so toxic, and why does it matter? To understand this territory, and what it’s implications are, it's helpful to return to Freud’s sense of the origin of melancholia; because the inability to live through disappointment well lies at its core. Freud proposed that in response to disappointment in a loved person, we retreated as children from the central relationship of our lives. We felt let down, but did not have the resilience or capacity to express this. Instead we turned inward, managing our despair through a blend of repression, withdrawal and self-attack. This gave birth to two patterns inside us: the feeling of disappointment was seen to be dangerous, and was rejected; and we could not bear to acknowledge that we felt ‘failed’ by those who mattered to us.This established significant and damaging precedents founded in a false resilience and premature 'independence': We neither communicate our disappointment to others, nor allow ourselves to experience it within ourselves. Both habits die hard. Many of us stay loyal to this early shaping, remaining, as adults, inclined to respond as if our hurt and disappointment are not there. We become accomplished at denial; we go on as if nothing has happened. But inside, behind the scenes, despairs accumulate; our hope falters, our bonds weaken; our relationships remain partial and insecure. Anderson’s words remind us of how bearable disappointment is. This is important. We can actually bear it. But we may not know this yet. I was 25 before I actually noticed disappointment as a possible feeling I could have. I am 25, away with a friend for a few days near the coast. With her, there is nowhere to hide. My pretence that I am happy meets such incredulous eyes that I cannot bear to be near her. I take walks to get away, but the beauty around me does not register. These are causelessly sad days imbued with an inexplicable devastation, a mood that hovers and bears thickly down. One day, on a walk, half-way down the beach, amid the mood, a word begins to form....Disappointment: the word leaves me reeling. Ridiculous though it may seem, amid frequent unhappiness, I have never thought to use this word about myself. I do not remember saying, to anyone, ever ‘I am disappointed’ - about anything. I always pretended I had never hoped for more. I swallowed hope. Now the feeling floods me. Until then, my pride was too strong. I had always had a category for sadness; when low, it became a natural blanket over everything. Sadness doesn’t accuse anyone, and it is not particular. It is a vague and comfortable fog, implicating no-one but us. Wehn we are sad, we can just hide out there, and flounder, invisibly, the contours of our hurt and hope obscured. Anger, disappointment, hurt: all are relational. They make us far more vulnerable. What if being disappointed is not necessarily a depletion, but a return? What if it can recall us to ourselves? Disappointment has a function and a message. Do we have the capacity and courage to feel disappointed when we are - to let it live and breathe a little, within our bodies and minds and among others? to our mood: will feeling this bring us down? to our relationships – are we preserving a false harmony at the expense of some imperfect, but genuine contact. Many of us pretend we’re not disappointed with others when we are. It is tempting to want it not to have happened, to move swiftly on. The continuations of our bonds seem to demand that. But there is a problem. The more we deny our true feelings, the less we entrust ourselves to others; the self we share grows thin, the foundation of our bonds becomes precarious, we begin to feel lonely and unknown, though this is precisely what we dread. We are up against primitive forces: our childhood conviction that disappointment cannot be borne ‘between us’. (We may also sense that the raw pain of it cannot be borne within). This pressurizes us to deny an inevitable experience: we don’t learn to feel disappointment naturally as part of life, and we don’t process our disappointment in ways that could protect us. Relationship is invariably a field of hope and disappointment, damage and repair. The more freely we can bear all this: the more buoyant and resilient we are, the freer to engage deeply with others. But for those of us whose bonds are tentative - who may have felt rejected or failed in early life - there is often a history of hope hurting too much, so we allow hopelessness to form in place of pain. We minimize desire; we are subdued. As we learn to be disappointed in ordinary, bearable ways - rather than see it as proof of our failure, or the fact that no-one cares for us - a relaxation and settling can occur. We allow ourselves to be affected, and not pretend otherwise. Apparently, I’m among the last philosophy-reading-humans alive to come to Marcus Aurelius. (Pretty much every friend I’ve checked with has been reading him for decades – so forgive me the enthusiasm of a new convert). Marcus seems kind of the philosophical equivalent to Leonard Cohen: people love the writing or ideas of other philosophers, but they love Marcus Aurelius. Why do we respond so personally to Marcus? (almost everyone calls him Marcus) I know why I do: a sincerity and intimacy runs through his writing. He is so clearly first and foremost, a human just like us, striving to see reality clearly and encourage himself to live well. It is so from the beginning: When we open the Meditations, we are introduced not to a grand idea or big question, but to a son, a father, a student, a subject of the gods. In his opening, Debts and Lessons, we meet him through his human origins: his relationships and how he perceives what they have brought to him. Aurelius speaks with the sobering humility of a middle-aged man taking stock. Compassion. Unwavering adherence to decisions, once he’d reached them. Indifference to superficial honors. Hard work. Persistence. Listening to anyone who could contribute to the public good. His dogged determination to treat people as they deserved. A sense of when to push and when to back off. I do not recall another philosophy book that begins from such earthed places. Just a man, naming where he comes from. This informal, yet serious tone runs throughout his work, in how he addresses himself, in the sincerity of his efforts to guide himself, and is central to how deeply his words land in us, so many centuries later. Marcus makes our acquaintance by declaring the human context of his life: the tribe he comes from, and the way he conceives of it. It is a peculiarly personal, naked introduction of self. I was so struck by the personal, unadorned tone of his writings that I wanted to check whether they had ever been intended for publication. No. Marcus was – as many of us are – writing to himself – in an effort to clarify the wisdom he could garner and the qualities he might hope to cultivate, based on what he treasured in those closest to him. A lot about his character is expressed both in the act of indebtedness and in what he identifies as being of value to him: a seriousness, a precision of perception, a breadth of care, a capacity for gratitude, and a generosity of that allows him to identify the best in others. In essence, he is saying: ‘before I begin to speak to you, let me tell you where I have come from. In terms of others. In terms of my indebtedness.’ Except he isn’t because he didn’t know we would read the words. This is beautiful not just as an expression of gratitude, but because it reflects the truth that we are all amalgamations, highly dependent on the care and sacrifice and battles already endured by those who have gone before us. So, by beginning with an accumulation of ‘sources’ - kind of a human bibliography of himself – Marcus avoids the delusion that we are separate selves: that we achieve our insights or capacities alone. By beginning his work this way, Marcus inadvertently debunks the myth of the independent philosopher of self-achieved genius. He does not claim any wisdom as a separate self; he voices origins. And as we take in his tapestry of indebtedness, we sense abundance: not necessarily an abundance of good fortune – though there is some of that - but an abundance of discerning intelligence and gratitude, an abundance of sources and the capacity to identify lessons worth learning and recognize indebtedness. Implicit in all this is an invitation to us all to be humble, and to reflect. Reading through Debts and Lessons, we cannot but become aware of those whose impact and gifts we carry inside us. What might emerge if we undertook the same task as Aurelius – if we took the time to acknowledge the many humans who have supported us and discern their specific gifts? Contemporary writer William Gibson coined the idea that each of us inhabits “a personal micro-culture” — the many elements that have made us who we are. Aurelius offers us an example of how to clarify our personal influences and origins. To map our lives this way, at any point, is to paint a rich portrait of where the soul stands ‘now’. Who and what would register for us? What would be ‘left out’ from our field of gratitude? (What remains unresolved or bitter inside us)? How capable would we be of discerning or appreciating the different gifts or lessons bestowed on us? What others would mean the most to us and how would our appreciation of them have morphed and clarified over the years?